Energy and Excitement! The Middle School walls pulse with the students’ and faculty’s contagious enthusiasm. We love to be here, and we want your daughter to love to be here because each day she will be challenged, nurtured, mentored, encouraged, recognized, and celebrated by our fabulous faculty. Here is where she will be given many opportunities to try and yes, even to falter. Here is where we want to open up a world of possibilities for her and hope that we can ignite her passion or spark her interest. Middle School is synonymous with change, and we wouldn’t want it any other way. As your daughter matures emotionally and physically, we want to be there to guide her along the way. These are the years where she finds out who she is, who she wants to be and where she wants to go. We understand that trying on new personalities and friendships is just part of growing up, and we relish the chance to help her determine her path. We've deliberately designed our MS spaces with the adolescent in mind. Each grade level has its own neighborhood wing complete with locker areas, social meeting places, a project room, and a shared computer lab. Most of the academic classes for each grade level are centered in this area. Students gravitate to their neighborhoods as socializing becomes more integral to their daily lives. Our core curriculum, along with our enrichment programs, supports our mission, “we learn not for school but for life.” We take this mission to heart and provide enriching opportunities to stretch our students' thinking. Our Academy Classes, Science Research, and West Fellowships are just a few of the exploratory and innovative programs that capitalize on students’ interests and extend their learning. 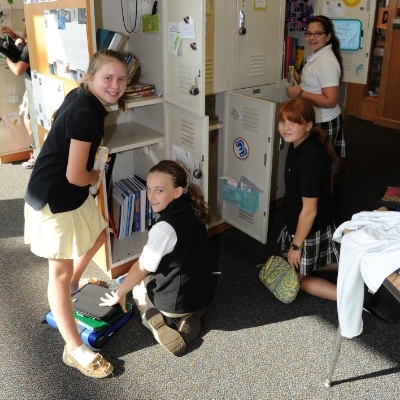 Middle School opportunities for leadership and service are provided to aid in developing a sense of responsibility and care for our extended community. Our hope is that you can visit and witness our girls in action, but be prepared to join in and experience the vibe. Read about the HB Difference. Click here for a directory of Middle School Faculty & Staff.